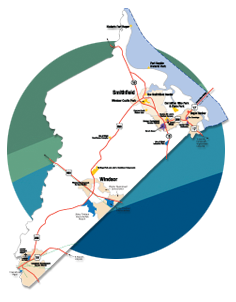 Isle of Wight County Schools consists of five elementary schools, two middle schools and two high schools. With just over 5,500 students and nine schools, the school division is small enough to provide personalized instruction centered on each child’s educational needs while operating from a global perspective to offer an array of rigorous and diverse programs that few similarly sized school divisions can match. All Isle of Wight County Schools are accredited or fully accredited according to Virginia Standards of Learning. STEaM Initiative – Isle of Wight County Schools is currently developing a STEaM Initiative for 4th-8th graders that will be implemented in phases beginning in 2016. CTE – Career and Technical Education (CTE) prepares students for a wide range of careers, 21st century workplace readiness skills and further educational opportunities. These careers may require varying levels of education, including; industry-recognized credentials, postsecondary certificates, and two- four-year college degrees. CTE is offered in the middle and high schools. Dual Enrollment – The dual enrollment program in partnership with Paul D. Camp Community College and Virginia State University allows students to obtain college credits while attending high school. Rankings – Isle of Wight County Schools is ranked 33rd among 132 Virginia school divisions and has a 93.8% on-time graduation rate (2017), which tops the state average. In addition to public schools, Isle of Wight Academy is a private Pre-K-12 institution for residents seeking private educational opportunities for their children.